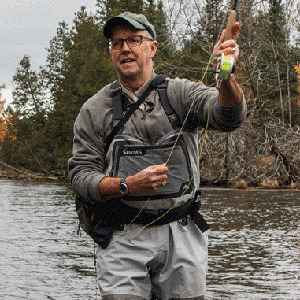 Joe Hemming, president of Anglers of the Au Sable, is a lawyer by trade, and his pro bono legal work helped stop a commercial fish farm that would have polluted the river. To recognize his efforts, Simms will donate $10,000 to Anglers of the Au Sable to continue their stewardship. Combine the following: a world-class trout stream in rural northern Michigan, a retired state fish hatchery, a politically connected fish farmer with the pomp and charm of a seasoned salesman, a state-sponsored aquaculture initiative, a thriving fly-fishing economy, a divorce lawyer working pro bono, the birthplace of Trout Unlimited, and you have a fair idea of the case that pitted the non-profit group Anglers of the Au Sable against a commercial fish farming operation on the headwaters of the Au Sable River. For years, the county operated the Grayling Fish Hatchery as a tourist attraction, raising just enough trout to keep the tourists happy. Kids fed the trout, or caught them from the raceways and had them cleaned. It was a classic roadside attraction, and was slowly losing the county money. In 2014, the county decided to lease the facility, for 20 years, to a fish farmer for one dollar (five cents per year). Despite numerous objections, the fish farmer then received a DEQ (Department of Environmental Quality) permit to farm up to 300,000 pounds of trout per year, and to discharge effluent directly into the river, just upstream of the most popular wild trout fishery in the state. No settling pond. No filtration system. Not even a performance bond to protect the river if things went awry. All he had to do, while farming all those trout, was allow tourists to come in and feed the fish. Astoundingly, the permit acknowledged that the fish farm would in fact lower the water quality of the Au Sable, but such pollution was acceptable due to the local economic benefit of the Grayling Fish Hatchery as a tourist attraction and the two jobs it would create. At a local county meeting regarding the fish farm, the objectors wore fishing shirts. The supporters in the audience wore suits, and were from the state capital of Lansing. It was at this meeting that the supporters of the fish farm first met Joe Hemming, a Detroit lawyer and Au Sable cabin owner. At the time the pro-fish farm folks surely didn’t suspect, as Joe stood and offered his opinion as to why this was a bad idea, that it would be him, and the organization that he would one day lead, that would ultimately be their undoing. “We only wanted the state of Michigan to require of this fish farm what it requires of its best state-run hatcheries,” Hemming said softly while remembering how this whole thing started. Michigan’s Au Sable is as famous for its place in fly-fishing conservation as it is for its trout fishing, and not just because it’s the birthplace of Trout Unlimited. In 1987, an FFI (then FFF) chapter, the Anglers of the Au Sable, was born: a site-specific conservation group with an entirely volunteer board. All donations were applied toward improving and protecting the Au Sable and Manistee rivers. Over the next 31 years, Anglers (as it is known) had a series of highly publicized victories. The group established catch-and-release on the most highly pressured stretches of river, fought off a gas well, and then took a case all the way to Michigan Supreme Court over the remediation of a plume of petrochemicals near the headwaters of the river. From all this smoke and fire the ominously quiet president of Anglers, Calvin “Rusty” Gates emerged victorious. Along the way the organization won numerous awards. Rusty was named Angler of the Year in 1994. He created an unwavering board and membership, a sense that if an activity or development crossed the mission statement of the Anglers of the Au Sable, then there was no choice but to defeat it. “Rusty defended the river at great personal cost. He was not afraid to offend those who would endanger the river and its fishery,” Tom Baird, former president of Anglers of the Au Sable, remembered. When Rusty died in 2009, the biggest perceived threat was hydraulic fracturing, not the Grayling Fish Hatchery. It was still just a sleepy old tourist attraction. That same year, Joe Hemming joined the board of the Anglers of the Au Sable. Joe Hemming is a decorated lawyer with a soft touch but the spine of a 12-weight. His specialty is family law, and his approach is amenable. He rarely shares his cellphone number, and most board members know it’s Hemming calling because their phones flash “no caller ID.” His cabin on the Au Sable is for family time, and for fishing. He lives in a stretch of river known for its massive hatches of Hexagenia limbata—the great nocturnal mayfly, which blankets the lights of his cabin in late June. He fishes in the dark, alone or with friends, in water so flat that you can see Orion simply by looking down. He joined the board of Anglers of the Au Sable and quickly became indispensable. In 2014 he became vice president to Tom Baird. He was elected president in 2017, right in the middle of the court case. “I think when I filed the Petition for Contested Case Hearing on behalf of Anglers back on August 28, 2014, I knew this case would take over a good portion of my life. From that date forward, it seemed that each new piece of evidence in our case simply added to my belief that this fish farm posed a terrible threat to the river,” Hemming says. To learn more about the potential hazards of the permit, Anglers of the Au Sable hired Dr. Ray Canale—a University of Michigan professor emeritus and expert on flow-through fish hatcheries and systems—to identify and quantify the threats of the fish farm. The numbers his modeling predicted were terrible, with up to 160,000 pounds of total suspended solids (primarily food and feces) being discharged into the Au Sable River from this new fish farm when operating at maximum capacity. The result, he and other experts warned, would be dissolved oxygen shortages, increased potential for introduced diseases like whirling disease, and the perfect living conditions for the mysteriously introduced New Zealand mud snail, the highest concentrations of which were now found directly below the Grayling Fish Hatchery. In the meantime, a push to make Michigan a hotbed for aquaculture was meeting statewide resistance. Proposed legislation was introduced to thwart efforts to turn the Great Lakes and its feeder streams into an aquaculture center. Major Michigan newspapers ran editorials arguing for and against aquaculture, and neither side was remiss in pointing to the battle on the Au Sable as something of an ideological ground zero.